Wix is a cloud based web development platform which provides you beautiful templates to start your website and drap-and-drop feature to create a website quickly. Users may also add more functionality to their websites such as social plugins, forms, e-commerce, etc. Wix is often used by startups or small businesses, as it can provide quick site creation with their beautiful templates and drag and drop interface. Due to this Drag and drop interface Wix is also easy to use. However, there are some limitations in Wix which one can experience as there Bussines grows. Wix is easy to use as it provides a user friendly environment, impressive templates with intuitive drag and drop options whereas, WordPress does not have drag and drop feature but you can still recreate this feature using the flexible themes and plugins. Talking about customer support, you will not face any problem in Wix as well as in WordPress. Wix has the massive support center. WordPress also have a huge community of webmasters, who are always happy to help you. Wix has a limited collection of apps to increase it’s functionality whereas WordPress has many plugins available in order to increase the functionality and these plugins also cover a wide range of functionality. So in WordPress you will get a lot of choice of plugins to increase it’s functionality. Wix also offers eCommerce features, but they are paid. This means that the users with free plans can not run eCommerce sites. Whereas there are many free eCommerce plugins for WordPress which you can use to run eCommerce sites on WordPress. 1. Intuitive drag-and-drop Interface : Wix provides a intuitive drag-and-drop option and it is favored for that. While moving from wix to WordPress, you will loose that wix feature. But you can still choose the one of its alternatives such as page wpbakery’s visual composer. 2. Templates offered by Wix : If you are really in love with the wix templates, then let me warn you, there is no way to actually migrate it from wix. Although, wix themes are limited as compared to WordPress themes, but they give good looks to the site. If you want same look and feel, then you can check the wide numbers of themes present for WordPress. Also you can recreate the theme using the Divi theme. 1. Buy Hosting from hosting companies : If you are moving from wix to WordPress, you need hosting. 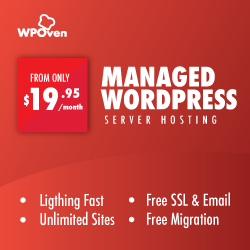 WordPress hosting is widely available, with options ranging from inexpensive shared hosting to specialized managed hosting. There are many hosting companies like WPEngine, Pagely, WPOven, Flywheel, etc. Check their plans and choose whichever fits your requirements. 2. Set up a temporary domain : Since your site is still on wix, you need to set up a temporary domain for your WordPress site. After the migration process, switch domain to point new site and change the urls of all the pages and posts accordingly. 3. Install WordPress on temporary domain : The third and the last pre-migration steps is to install the WordPress on the temporary domain. Many WordPress hosting companies install WordPress on the domain by default, so you can skip this step. Otherwise, many hosting companies provides easy one click WordPress installation, so you can follow the steps and get it done within minutes. The most common migration is manual migration in which you manually migrate pages and posts one by one. It is the most effective way of migration but it takes a lot of time too. Also it is not possible for the sites having more number of pages and posts. This migration is like copying the content from wix to and pasting it into WordPress as in any text editor. The benefits of moving the site manually is that you will be sure that every piece of content is moved to the new WordPress site. It is the best way to move the site from wix to WordPress. But we recommend this method if you have a small site (i.e less than 25 posts and pages). The drawback of this method is that it is time consuming, especially if you have more than 25 pages and posts. For small sites, this method i.e the manual migration method is best and reliable. The first step is to create the pages and posts in WordPress site. This will speed up copying and pasting the process. Once, the pages and posts are created, you need to copy the content from wix pages and posts and paste it on the WordPress pages and posts. If you have the bigger site i.e large number of posts and pages and moving those pages or posts is not possible using the manual method, then you can automate some of the things. Automating things also reduces the chances of getting errors and hence work is done faster as well as without errors. This can be considered as the second best option available for the migration. Many platforms provides RSS feed for the blog that we can use to help automate the process of migrating our blog posts, Wix being one of them, also provides RSS feed. We can use the RSS feed provided by Wix to help automate the process of migration. RSS feed does not include images, so we need to import them later. Now, to import the Wix RSS feed to WordPress, check that default WordPress importer is setup. Click ‘Tools’ menu from the admin bar and then choose ‘Import’ option. Unfortunately, there is no automated tool to import pages from Wix to WordPress. Although WordPress provides the plugin to import HTML pages, Wix does not allow to export the pages. So, we need to use the manual method method to convert pages. You can use the bulk page creator to create the pages and copy the content from wix site to WordPress site. You can also fix the formatting issue with the content and also fix the links before moving to the next step. You can manually import the images by manually saving the images on your system and re-uploading it and then fixing the links. You can also use the plugin Import External Images for this purpose. This plugin examines the HTML source of your post when you save it, inspecting each IMG tag, and processing them according to the options you have selected. 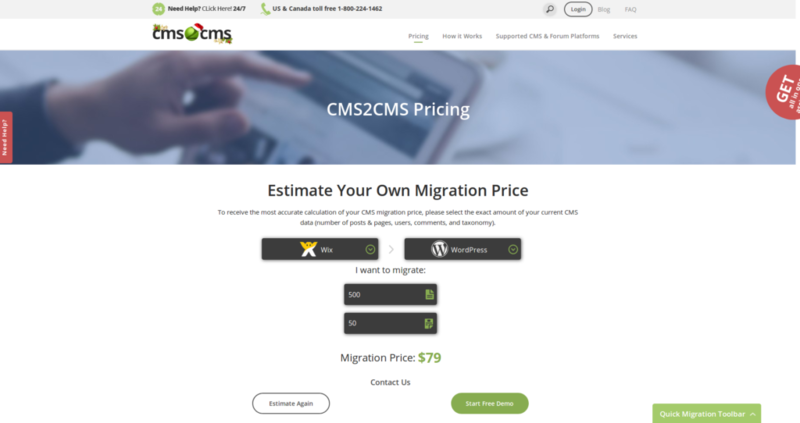 There are many online paid services available for site migration like cms2cms.com. They provide services to migrate from one cms to another cms with reasonable cost. The pricing of cms2cms.com can be seen here. These are the best options if you do not want to spend much time in migrating your site or having trouble. This is the easiest option available where you do not have to worry about anything and you will get your work done perfectly. 1. Choose the theme for your website : As already discussed, Wix provides a great template but it is not possible to get the same on WordPress. The theme must be chosen for the website from the WordPress themes itself. You can also customize the themes in WordPress using Divi theme. 2. Setup all other features : Now, you have to setup the add on features like forms, seo, etc. You can also add widgets to the site. Customize the site as per your needs. 3. Test the Site : As the site is nearly migrated, you can check all the functionalities of the site. Also check whether all the pages and posts are migrated by automated migration and every media is linked correctly or not. To check the broken links you can use Broken Link Checker to scan all of your pages and posts and notify you about the broken links in the pages or posts. You will get the code on your registered email Id which you have to provide to new host to complete the transfer process. Once the testing and domain transfer is done, you can now change WordPress site to use the new domain. First, change the General settings and change the home url and site url from temporary domain to live one. And then you need to change the url of every page and posts. In order to change the url of every page and posts, you can use the WordPress plugins such as Velvet Blues Update URLs or Go Live Update Urls. In plugins, choose the settings which are relevant to you or which you want.